Congratulations, you’re a multinational company! All you need to do now is get your content translated into a couple of other languages for your expanding audience, right? Before you even think about translating your content, you need a strategy for organizing, managing, creating, delivering, and distributing your content to your global customers. You also need to be sure that you’re working with high-quality, grammatically-correct content that will make sense to your intended audience once it’s translated. After all, if you have issues with your English content, those issues won’t just be four times worse translated into four different languages. They’ll be exponentially worse. It’s not enough to translate your English content. You have to customize the content to serve the needs of your intended audience, while being sensitive to cultural norms and linguistic quirks. You also have to understand the perils of translating too little content—or too much. If you translate too little content, your global audience might not have enough information to make crucial decisions. Translate too much, and you face increasing expenses and organizational headaches. We can help you decide exactly which content needs to be translated to meet your goals. With an effective global content strategy, you’ll select just the right amount of content and you’ll write in a culturally-sensitive way. You’ll optimize the content to make it easy to read and easy to translate into all of your languages. And you’ll get an added benefit. Best of all, by optimizing your English source content, you’ll save time and money on translation. Once your content is optimized for translation, we’ll help you manage and organize the content so that you can keep it updated, and your global audience can find it. Our pre-translation editing service hits the trifecta: better, cheaper, faster. We improve content quality and make content easier to read. That way, it’s cheaper (and faster) to translate, so you can get it out to your global market more quickly. Including the word “please” in each set of UI instructions—Please contact your system administrator or Please call with questions—might sound polite. But, it can cost you big-time. Why? Because every word adds to the cost of translation. Once your content is translated, we’ll review it to ensure that your intended audience understands exactly what you’re trying to say. We use state-of-the-art tools and linguists who are native speakers to assess your translations. Our multilingual translation content quality audit service will point out any translation errors, problems with translation memory, and workflow issues that may impede the clarity of your message. Got Global Content Strategy Problems? We’ve Got Solutions. When you don’t know where to begin, how to make translation happen, or what tools you need, global content strategy provides the guidance you need. We can reduce translation costs by optimizing your content, selecting the right content for translation, pinpointing how much content to translate, and providing thorough pre-translation editing. Global content strategy helps manage the translation workflow for maximum efficiency, from beginning to end. Pre-translation editing services can help improve translation quality and consistency. And translation quality audits ensure that your translated content makes perfect sense to native speakers. Learn What it Takes to Streamline Your Content Like Never Before! 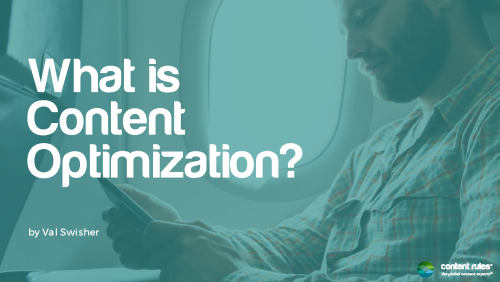 We demystify content optimization and show you how to deliver the right content to the right people on the right device in the right language. Download our free e-book now to learn what it takes to optimize your content like a rockstar! !